Fashion can be fickle, but some pieces are so classic they never go out of style. Sarah Humphreys, executive editor of Real Simple magazine, shared the kind of clothing you can invest in to always look great. Strictly for the cockpit set when it debuted during World War II, the bomber jacket, which saw plenty of action after it caught on with 80s-era trendsetters, like Madonna, is chic and a little tough and rugged at the same time. Leather Jacket from INC at Macy's for $123.46 to add a little edge to a flirty and seasonal flare dress (Also Jones New York $149). We also love a leather jacket worn with trousers and a blouse in place of the traditional suit jacket for an unexpected twist. Ultra-fitted bottoms -- veterans of the Mick Jagger style era ― are a recurrent trend for a reason. Skinny jeans can be dressed up or down, are great for layered looks in the winter, and also pair perfectly with airy tops that are hot for spring. Classic Skinny Jeans ($79.00) from Lauren by Ralph Lauren. We paired it with an expensive silk Lauren Blazer ($290) to show you how to dress up the look but you can throw on a tee shirt for a great casual look as well. 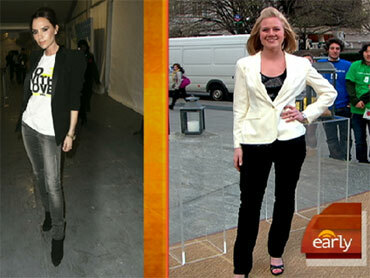 "The Early Show" model wore her own cami/tank under the jacket, and Lauren by Ralph Lauren shoes. Generations of high-stepping women have loved these shoes since Italian designer Salvatore Ferragamo crafted the first pair from wine-bottle corks in the 1930s. Wedges give women the feel of added height, but are much more comfortable to wear than typical heels because of the thicker sole. The sheer comfort of these shoes make wedges year-round staple. Dylan Peep Toe Espadrille Wedge in gray from Banana Republic ($89) paired with a Banana Republic halter dress ($175) and Banana Rrepublic clutch ($89.50) that's perfect for spring. You could also wear the wedges with shorts and trench for a more casual look. The understated elegance of a button-down shirt can easily take you from an afternoon board meeting to a weekend romping around. INC International Concepts Tunic, Long Sleeve Silk Pintuck, ($69) with black leggings with zipper detail (Also from INC $39). This fabric will give you a luxurious look that pairs well with classic pieces for the office, but here the subtle sheen of the material ads elegance to standard leggings and flats. You can always add a belt to give yourself an hourglass shape.